A group of scientists from Queen's University Belfast and the Max Planck Institute for solar system Research in Germany have turned exoplanet-hunting on its head, in a study that instead looks at how an alien observer might be able to detect Earth using our own methods. They find that at least nine exoplanets are ideally placed to observe transits of Earth, in a new work published in the journal Monthly Notices of the Royal Astronomical Society. Thanks to facilities and missions such as SuperWASP and Kepler, we have now discovered thousands of planets orbiting stars other than our sun, worlds known as 'exoplanets'. The vast majority of these are found when the planets cross in front of their host stars in what are known as 'transits', which allow astronomers to see light from the host star dim slightly at regular intervals every time the planet passes between us and the distant star. In the new study, the authors reverse this concept and ask, "How would an alien observer see the solar system?" They identified parts of the distant sky from where various planets in our solar system could be seen to pass in front of the sun – so-called 'transit zones'—concluding that the terrestrial planets (Mercury, Venus, Earth, and Mars) are actually much more likely to be spotted than the more distant 'Jovian' planets (Jupiter, Saturn, Uranus, and Neptune), despite their much larger size. "Larger planets would naturally block out more light as they pass in front of their star", commented lead author Robert Wells, a PhD student at Queen's University Belfast. "However the more important factor is actually how close the planet is to its parent star – since the terrestrial planets are much closer to the sun than the gas giants, they'll be more likely to be seen in transit." To look for worlds where civilisations would have the best chance of spotting our solar system, the astronomers looked for parts of the sky from which more than one planet could be seen crossing the face of the sun. They found that three planets at most could be observed from anywhere outside of the solar system, and that not all combinations of three planets are possible. 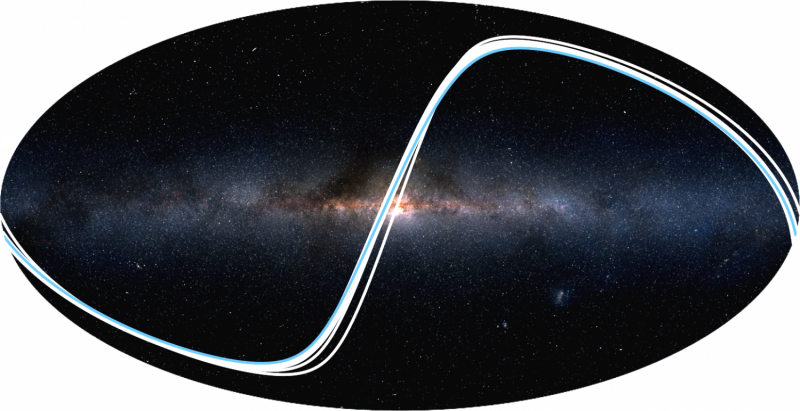 Katja Poppenhaeger, a co-author of the study, adds, "We estimate that a randomly positioned observer would have roughly a 1 in 40 chance of observing at least one planet. The probability of detecting at least two planets would be about ten times lower, and to detect three would be a further ten times smaller than this." Of the thousands of known exoplanets, the team identified sixty-eight worlds where observers would see one or more of the planets in our solar system transit the sun. Nine of these planets are ideally placed to observe transits of Earth, although none of the worlds are deemed to be habitable. In addition, the team estimate that there should be approximately ten (currently undiscovered) worlds which are favourably located to detect the Earth and are capable of sustaining life as we know it. To date however, no habitable planets have been discovered from which a civilisation could detect the Earth with our current level of technology. The ongoing K2 mission of NASA's Kepler spacecraft is to continue to hunt for exoplanets in different regions of the sky for a few months at a time. These regions are centred close to the plane of Earth's orbit, which means that there are many target stars located in the transit zones of the solar system planets. The team's plans for future work include targeting these transit zones to search for exoplanets, hopefully finding some which could be habitable. How many planets are there in the galaxy? Is our solar system weird?